The Fat Deli is a bit of an inbetweener – more formal than a traditional deli, but more laid back than a restaurant. Basically it acts as a great place for a slightly posh lunch, which is what we opted for one chilly December weekday. 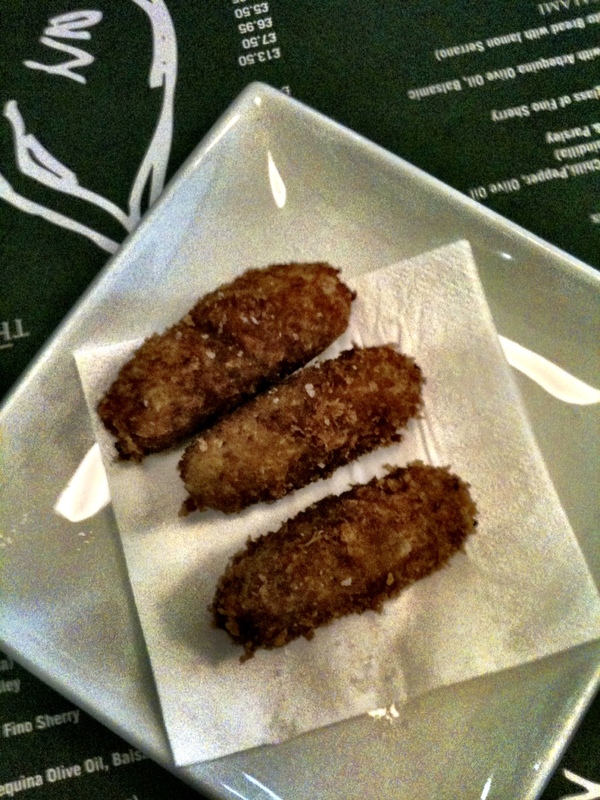 The menu boasts a large amount of regular favourites including addictive tapas bar snacks. Think cured meats, salty cheeses, olives, pickles… there’s a whole lot of smorgasbord action going on. For a little pre lunch nibble we opted for the ham croquettas; cheesy, potatoey breadcrummy, um, croquettes which the Fat Deli sprinkled with extra rock salt, as if we needed them to be any more addictive. 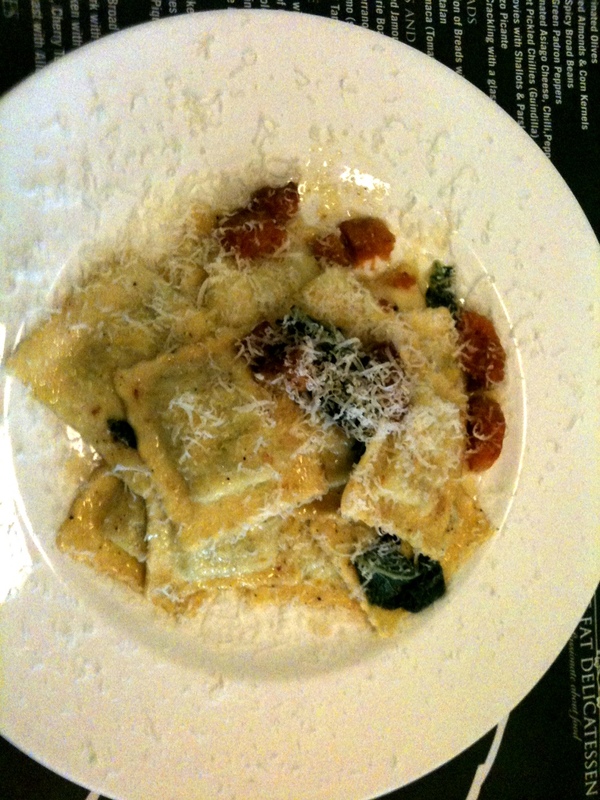 For our main lunch we went for spinach and ricotta ravioli with pumpkin and a sage butter dressing, and a lentil, pancetta and chorizo stew. The pasta was plentiful (available as a small or big portion, we of course opted for the larger plate), as was the parmesan (big thumbs up from fromage fans at SJ) and the sage butter dressing really addictive, but we could have done with a few more chunks of pumpkin dotted around the dish. 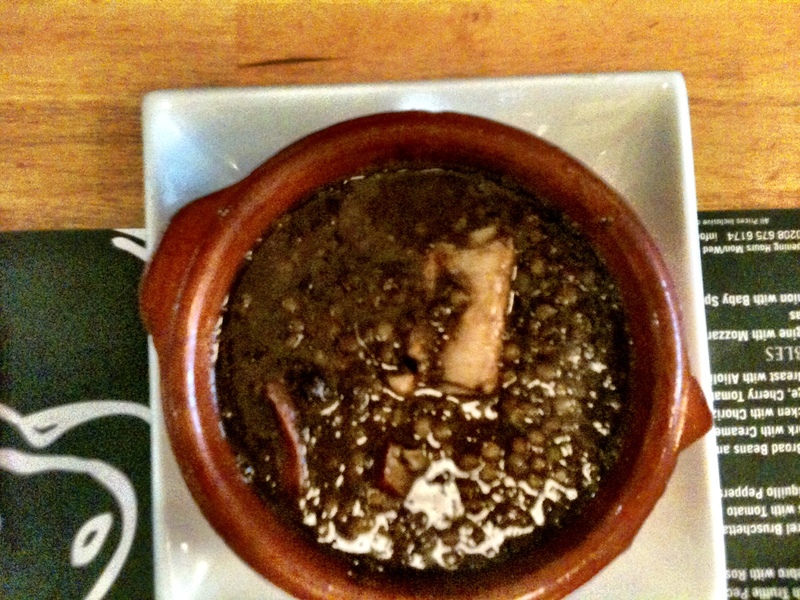 The stew was served in a deep tapas dish and initially we had a false sense of “oh, that’s a little small”, only to find that what lacked in size made up for in richness and flavour and that actually, we were full when we finished (always the way – eyes bigger than our stomach!). Particularly impressive was the quality of the meat. Chunks of pancetta fell off the bone and the chorizo sizes were generous, adding an intense smokiness to the sauce. The ambience was casual, just as you would typically see in a deli at lunch. The clientele at the time of eating consisted of young mums finishing off their morning coffees but it was peaceful, not rowdy. Including tip and soft drinks our bill came to around £25, pretty good going for a homemade lunch that satisfied our bellies until dinner (well, we’re only human…). Enq: The Fat Delicatessen, 7 Chestnut Grove, SW12 8JA.